With heavy metal actually dominating the rock music scene in the summer of 1984, (trust me, it did), metal acts were coming out of the woodwork thick and fast. It was only right that a female metal artist come forward in what is a male dominated world. 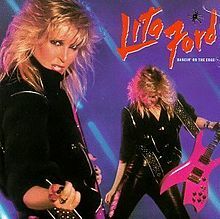 The metal world had Girlschool and Rock Goddess from England and from the USA came former Runaways guitarist Lita Ford. “Dancing on the Edge” was her second album and I’m kicking myself for never noting her first one but it was this album which made me and the rest of the world take notice. “Dancing on the Edge” came out amidst controversy in Lita’s personal life. First there was her supposed feud with former Runaways band members Joan Jett and Cherrie Currie. From what I’ve read, the feud with Joan was more or less fabricated by Joan Jett’s management who didn’t want Lita anywhere near their star. She was also engaged to Black Sabbath guitarist Tony Iommi at the time and he appears in the video for “Dressed to Kill” from this album. However, Lita has said that the relationship was marred with physical abuse due to Tony’s drug problems back then. 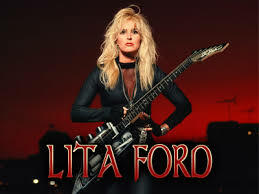 Therefore, it’s an amazing endorsement of Lita Ford herself that she could put out such a killer album in spite of all the things in her personal life. Cutting right to the chase, let me just say that “Dancing on the Edge” is a fantastic metal album. There a lots of great power chords and Lita has a great voice but the best thing is that she can really shred. She does this very well on every song. So well in fact, that it has always been difficult for me to pick a favourite track on the album. Each time I listen, I discover something small in a song that I hadn’t noticed when I heard it before. Therefore, I am forced to conclude that the album simply has nine fantastic songs of pure metal mania. God, I’m pinching quotes from Dee Snider. While Lita shines on vocals and guitar, she has two very capable musicians providing that all important rhythm section. On bass was Hugh McDonald who is currently with Bon Jovi and Randy Castillo who would later play for Ozzy Osbourne and Motley Crue on the drums. That can only help make “Dancing on the Edge” that much better. “Dancing on the Edge” cemented Lita’s permanent foothold as a serious metal artist in 1984. From there, her legacy would continue to this day with loads more great albums.